This is a great tomato paste. I freeze it in ice cube trays, pop them out of the trays then freeze in bags. They are terrific for pizza, minestrone, pasta sauces, etc. I now live in Maine after 11 years in New Mexico and still come back to this site for great recipes such as this one. Thank you for your comment and wonderful feedback! We greatly appreciate it! 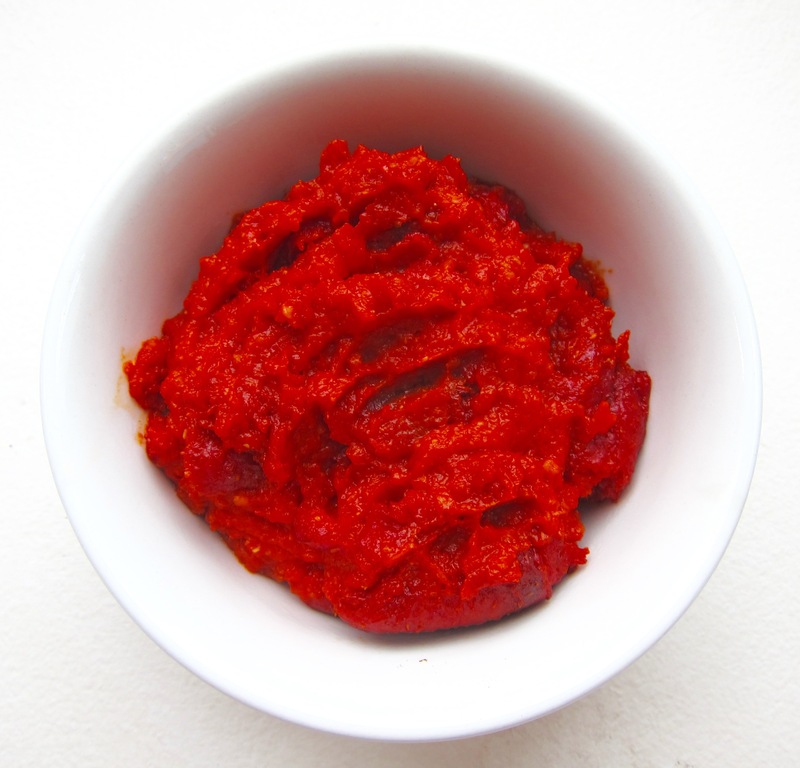 Homemade tomato paste can’t be beat, and will quickly become a kitchen staple. Fresh tomato paste can add large amounts of depth and flavor to many dishes, even when used in small amounts. From stews and dips, to sandwiches and sauces, just a teaspoon or two of good tomato paste can elevate a “meh…” meal to a “yeah!” one. But the canned tomato pastes purchased at the grocery store have a tinny or metallic taste to them, and lack real flavor. This is probably why so many cans of tomato paste languish, opened and barely used, in the home refrigerator until they are tossed. To solve this culinary crime, do yourself a favor and make your own homemade tomato paste using farmers’ market tomatoes! It’s easy to make and wonderful to have in your refrigerator to enhance many meals, from morning to evening. Five pounds of farmers’ market tomatoes. Simply lovely! Heat oven to 300 degrees Fahrenheit. 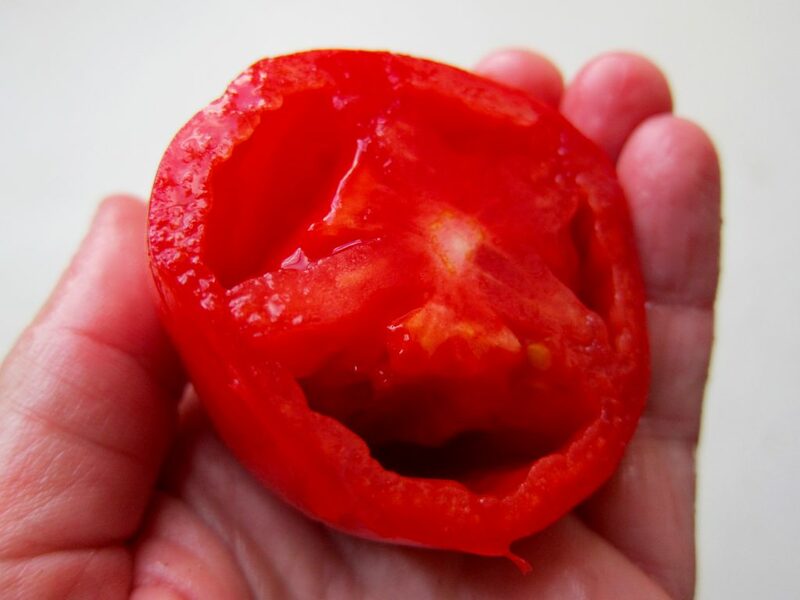 Wash tomatoes and cut them in half. Squeeze each half gently over your sink or compost bin to remove excess juice and seeds. Squeeze halved tomatoes to remove excess juice and seeds. Chop squeezed tomatoes into coarse pieces. Heat olive oil in a deep skillet over medium heat, and add chopped tomatoes, salt, and any additional herbs or spices. 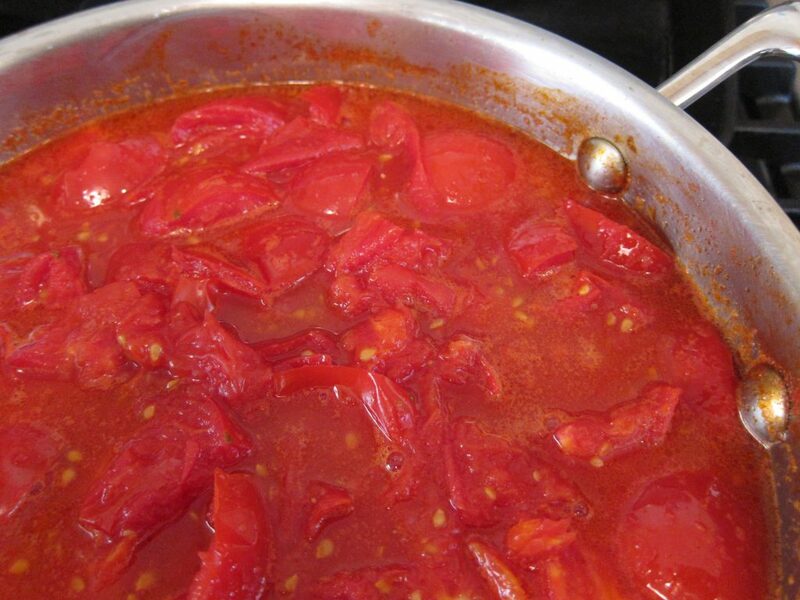 Bring tomatoes to a boil, then lower your heat and simmer for about 10 minutes, or until the tomatoes are soft. Simmer the tomatoes for about 15 minutes, until they are soft. Place simmered tomatoes into a high speed blender (or a regular blender) and blend at high speed until fully pureed (including the skins and any seeds that didn’t get squeeze out). 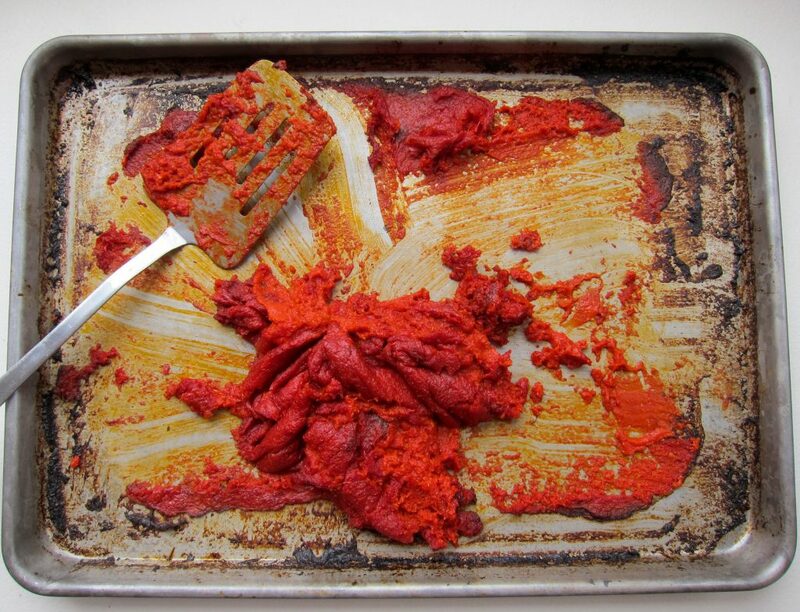 Rub a deep, rimmed baking sheet with a bit of olive oil and pour the tomato puree into it. Five pounds of tomatoes should just fit into a deep, 13″ x 18″ rimmed baking sheet. 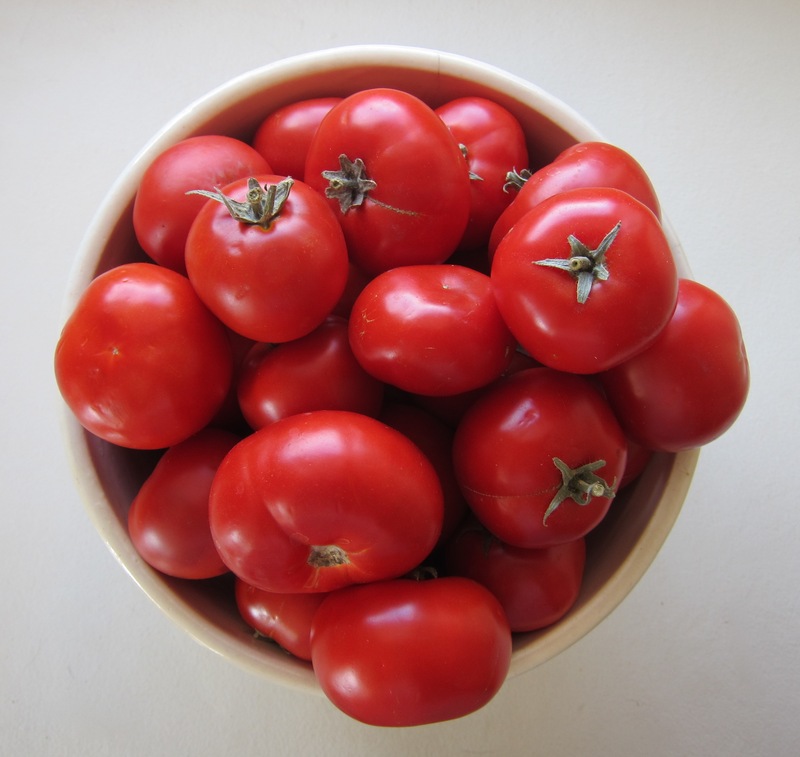 The puree of five pounds of tomatoes should fill a deep 13″ by 18″ baking sheet. Bake the puree slowly, using a spatula to turn and mix the puree periodically during cooking. As the water evaporates, you’ll notice that the edges of the puree will start to darken; look for this darkening as a sign that it’s time to mix the puree and spread it out evenly over the baking sheet again as it thickens. 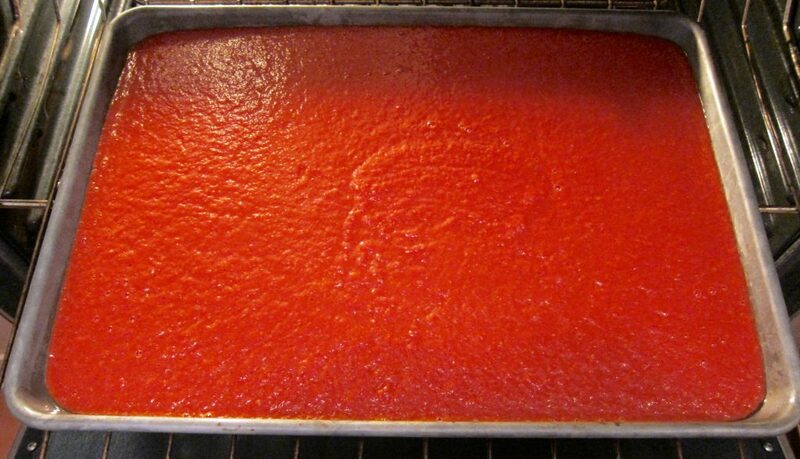 After 3 or 4 hours of baking, the tomato paste will be thick and a rich, red color. 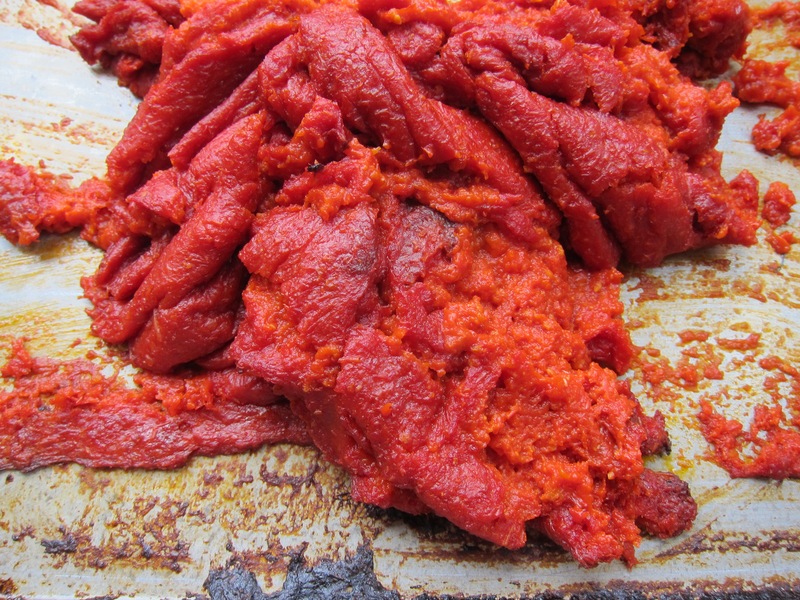 When the tomato paste is thick and brick-colored, the tomato paste is done! Store your tomato paste in the refrigerator for a month or more in a sealed container; cover your tomato paste with a layer of olive oil to increase its keeping qualities. You can also freeze tomato paste in individual small containers for six months (take out what you need and let thaw in your refrigerator). Fresh tomato paste is fantastic spread on sandwiches with cheese, added to pizza, and added to sauces and stews. The homemade variety is so delicious you’ll find it creeping its way into your daily use along with staples such as peanut butter.